Feel free to post your feelings or questions about this project. I'm going to take a guess and say his idea of a game is Raging Blast style of gameplay with more characters than BT3. No, take a look at his project and you'll see how epic it is. He changed gameplay somewhat, changed graphics, changed content, and changed the physics. He's basically the DBOR of DBZ console games except he's not making the game himself. :O Does it has a co-op story mode? Yes, but he's not making the game. He's trying to get Namco Bandai to make it. I wanted this to come out instead of Ultimate Tenkiachi and Battle of the Z. Too bad RB3 will not happen though. He showed the project to Namco Bandai but they already started making Battle of Z. Yeah me too. Wow, I was expecting more hype for a project like this. Live with honor and die with pride! I know right. I can't wait!! ;D But more support would convince them even more. Doesn't hurt to support it even though it may or may not have been confirmed. No offense, but I doubt it's this guy's project. If it were as simple as just saying "this is the type of game we want," then we wouldn't have ended up with stuff like Ultimate Tenkaichi or that Kinect turd. Sadly, most developers don't listen to the fans. While the sales for the DBZ games have dropped since the PS2 era, they still make gobs of money. And all of us are partially to blame, 'cuz we bought them (granted, at the time we didn't know they'd be bad, and a lot of the trailers looked mind-blowing). There's some games that weren't actually bad, either, but should've been restricted to a different system. The Budokai Tenkaichi (except BT2, and I'm not counting Raging Blast as I haven't played it, so I can't speak for it's quality) games were awful, and Battle of Z is pretty mediocre on the consoles, but the handheld incarnations? Awesome. Tenkaichi Tag Team (which seemed to be built off of BT2 thankfully) and the Vita version of BoZ both feel "right" as handheld games. There are some developers who listen to the cries of gamers, but not many. And given that they release a new major DBZ game nearly every year, I doubt that Namco-Bandai is listening. Especially since they aren't the actual developer (that's usually given to another company). We don't even know who the developer of this new game is, whether it's Spike or... whoever did Battle of Z (I don't remember who). Personally, I'd like to see Dimps (the developers of the original Budokai games) take on a Raging Blast style game. It really is his project. He's been adding little things to his project for a long time. He has devoted his free time in making more ideas for the fans. He's not making the game, as I said before, but he's making a whole glob of fans' ideas into one project. He did this so we have a better chance of being heard by Namco Bandai. We ended up with Ultimate Tenkaichi and DBZ Kinect because Treevax didn't even show them the project yet. As for Battle of Z, Namco Bandai started the project before Treevax had a chance to show them the project. Most developers don't listen to fans, but it doesn't mean it's pointless to try. Treevax has actually given me hope that one day we'll have a great DBZ game, maybe not perfect, but a great one. I believe Namco Bandai will listen, and probably already have because Namco Bandai even stated that they were impressed with his ideas. Maybe they'll show the ideas to Spike, Dimps, or whoever is making the game. Anyway, I'm pretty sure they're listening because one of the images show what looks like a more in-depth character creation which was one thing Treevax wanted. Same with the graphics, they might not look exactly like the anime, but it is a step forward. Treevax also said he wanted a more interesting story to character creation which was answered by what looks like time-travel quests for character creation. 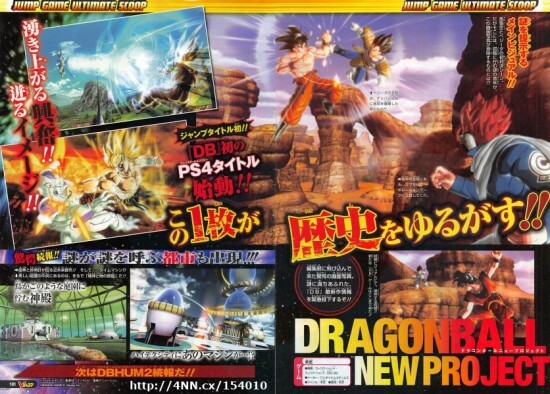 As you can see here: http://i.imgur.com/agq2GCo.jpg Three ideas that were in originally in Nostal Treevax's DBRB3 Project happened to appear to be in the new Dragon Ball game. Well, I'll remain skeptical, but I really do hope it will be good. I'm not trying to deflate anyone's hopes, but a lot of games that looked incredible wound up being letdowns. And I never meant that it's pointless to try, of course. Sometimes they do get it through their thick skulls. And if they really did listen to the fans and made the DBZ game we all want, then I'll happily eat my words. Honestly, the character creation alone is enough to pique my interest (especially if we're not stuck with another bland male Saiyan). But it could also all be a coincidence. I just don't wanna get my hopes up again, only to have them dashed because "Oh look. Bare minimum." If they make this, and continually add-on to it, rather than just minor upgrades for the next 10 years (or worse pulling a BT3 and making it a downgrade ultimately), that'd be even better. Not bad, good luck for the guy who is doing this. And remember to post your comments about the project/new outfits! More outfits were added. I think I see Kid Krillin! Don't worry that's just 3/9. Piccolo will get his share of outfits eventually. The 4th "outfits" sheet will be uploaded next friday (June 6th)! Stay tuned! And @KingPiccolo this may have Piccolo outfits in it!! I know right. I've seen this guy's work since he had 5000 likes. He never disappoints.